Which components are likely to experience the most wear and tear, and thus be in need of more attention, and which components would experience the least? How will refurbishment requirements affect the design of the launch vehicle and relevant stages? What kind of continued evolution or iterative improvements are we likely to see in relation to this? How long before a re-used stage/vehicle would be deemed suitable for human payload? More than a decade? Never? Well, for starters, they'll need to wash it. Well, is washing something they can do before loading it onto a transport and hauling it back to the workshop? Or is it best done back at the workshop? I imagine that it would be most easily done if the core is mounted horizontally on those circular rings, rotating like a bird on a spit while a pressure washer slowly moves from one end to the other, kind of like a lathe. How much force is needed to remove the soot, anyways? You certainly don't want to use too much water pressure and accidentally damage the skin. The problem is that until they have gone through a few iterations that involve serious inspection and testing, they don't know whether testing and inspection is the bulk of the work or whether there are other additional expenses and delays. Given the level of testing, inspection, and support work that gets done on a new first stage, it is possible that the level of work involved is only about $1M more than qualifying a new stage, on the other hand. If it becomes routine for one turbo pump or engine bell out of nine to need replacing, or if a large number of valves need replacing it could be more. If the helium tanks need replacing each flight ... a lot more and a lot of time and manpower. I am thinking they might spend $5M just on testing and inspecting each of the first few cores they consider for reuse and that they pick the best, refly it, recover it and spend as much again to try and figure out a delta on every part and system that degrades. After those first few inspections they may change some designs before reflying anything, and/or maybe after a reflown core is recovered there are some (more) design changes. It will probably be an iterative process over the next two to three years, but it is still possible that they do reflight of an upcoming core from 2016 Q1, but not impossible to imagine that it takes until 2017 before a Q2 or Q3 2016 core gets reflown. The first reflight will probably represent a lot of testing and inspection of cores. Spin it fast enough and it'll clean and dry itself. Ask any dog. There had been discussions of using the landing legs to slow the descent, but after watching the Grasshopper tests, the legs took quite a thermal beating being so close to the Merlins. This may explain why the legs are deployed so late in the landing process in order to reduce damage. There may still be an ablative layer on the legs that will require replacement between launches. Whatever they do, they're not going to power wash the stages in the HIF. I don't think that's an environment you want to be splashing water everywhere. As we head into 2016, with the very real possibility of returning up to 12 or more cores, they'll need to find/build some storage space. IMO, HIF is for what it stands for, Integration. As their launch tempo increases, they'll need a new facility for cleaning, inspecting, storing before it arrives at an HIF to be integrated for launch. For all we know they have already identified such a building or space to erect a new one. And if they haven't, I suspect after this successful landing, they're doing so now with added haste. It seems predictable that the early period will involve more painstaking inspections, which will then later give way to more specialized inspections once you know which places experience the most wear and tear, and which places experience much less wear and tear. In relation to the soot from re-entry heating, is there any chance that one day we'll see the implementation of an aerospace equivalent of "brake pads" - by which I mean some kind of superficial attachment that takes the brunt of the re-entry heating leaving the rest of the rocket unscorched, and that component is then very easily/quickly swapped with a fresh part? Will we ever see things reach the equivalent of a Formula-1 racing pit-crew, where they can quickly unbolt the "tires", etc, and swap on fresh ones, etc, to rapidly make the vehicle ready for use again? I thought that perhaps that Formula-1 racing is a better analogy than conventional aircraft maintainenance, since the typical aircraft doesn't take as much punishment during its flight to warrant the same level of parts replacement so frequently. As flight rates increase, will we inevitably see reusable rockets evolve towards designs meant for easy-swappability? "Until we see it done regularly, we can't be sure that washing a stage is possible, and if it is, that it is profitable. So far SpaceX demonstrated nothing of the sort." Why does it need to be washed in the first place? One reason I've seen is that rocket fuselages are painted white in order to help keep the LOX from boiling off too quickly. Black soot would defeat that purpose, by causing solar radiation to be absorbed and therefore increasing the boil-off rate of the LOX. That's right. Now get that thing back on the pad, fuel it up, and light it off. That's the Falcon 9. You can safely assume that they have optimized it for easy swappability of components that may need swapping. We know that about the engines. They can easily swap them on the pad vertical. It was already for the 1.0. They have swapped valves and sensors quite easily during launch campaigns. It just gets necessary less frequently after early bugs have been identified and resolved. It is not an unreasonable assumption that servicing the stage and getting it ready to fly may cost less than getting it ready to fly the first time. Though after a number of flights a more thoroug workover that might deserve the name refurbishment will take place and will take longer. Maybe the layer of ice that will accumulates on the LOX tank kinda alleviates this problem (eq. it is white & has bad thermal conductivity)? If the speculation in other threads is correct and the un-sooted area is over the LOX tank (due to it being frosted while soot was being deposited) then, perhaps, there isn't a need to wash the rocket? I wonder just how hard to wash off that soot is? If it's anything like diesel engine soot on paint, it'd be easy on a gloss or semi gloss finish, while hard to do on matte (it gets in the pores). My guess is that it'd come off fairly easily if soot, but if it's burned paint, it'll be a hard job, so in future they might use a different paint formula (such as enamel). As for other aspects of reuse, my guess is SpaceX is using some kludges this time around, while they see what's really needed. For example, I'm betting they will come up with an easier, cheaper way to lower and transport the landed stage. The same would go for all the details that go into prepping a stage for reflight; it'll be a learning experience, and thus quite slow at first (much like the first F9 launches took a lot longer to prep than what we see now). Yes; SpaceX first needs to characterize use or aging effects. Most of that will likely come from inspection in the beginning. The end process will undoubtedly be similar to that used for aircraft, which includes both preventive and predictive approaches. High performance jet aircraft is probably a better model. All other things equal, the goal is to reduce the need to replace components as that increases costs, especially labor. Ease of replacement is only one aspect of maintainability, which includes ease of monitoring, inspection, test and replacement. Not all components will (or should) be treated the same. E.g., some components may be designed for ease of inspection over ease of replacement; other components may have extensive monitoring to identify conditions which require more extensive inspection or testing; etc. 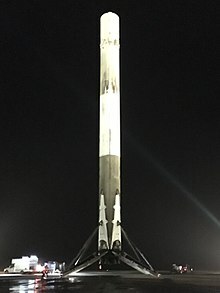 SpaceX will undoubtedly be making changes to improve reliability and maintainability based on what they learn from returned vehicles. Much too early to tell what those changes might be. A coat of paint has weight. I don't know how much the soot weighs. After 1 flight? After 10? I agree that the LOX might be protected by its own ice layer. If the outer skin is sooty, does it mean that every time you go to open a service hatch, you get your hands and your clothes dirty? Then you get the soot over whatever it is you're servicing? This could be an issue. Gee, when I look at the soot on the fuselage, it's too bad that the legs don't have some kind of webbing between them, which could not only improve the drag characteristics on the way down, but also shield the rest of the fuselage from collecting soot. But I guess leg-webbing would be extremely problematic during ascent. Maybe the HEB car wash in Brownsville will add a 3.6 meter bay. It's only 6 bucks if you pay at the pump. They even sell kerosene.